« Intel Producing 32nm Processors Next Year! I’m now writing in WordPress 2.7 (codenamed Coltrane). 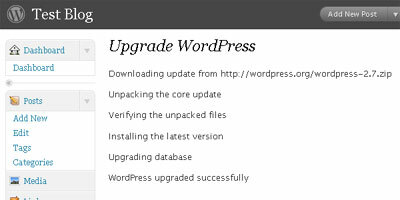 Yes, it’s another round of upgrade just 2 weeks after the previous version WordPress 2.6.5 was released. This version is a major upgrade with various changes and enhancements feature and security wise. So, it’s recommended to upgrade to the latest WordPress 2.7. Since it is a major upgrade, you’ll need to do database backup before upgrading because it involves database upgrade as well. *Not all web hosts support this feature. I’ve checked WordPress Upgrader on our server at IXIY Hosting, it’s running perfectly. So now we can upgrade our blogs with just 1 click! Check out the screen capture I took. For full list of new features, visit here. Overall, I’m pretty happy using WordPress 2.7 and I’m still in the midst of exploring all the new changes. One thing I find it problematic is that it’s lagging while I’m typing in the write box. The moment when I finish typing, the letters is still appearing one by one. Anyone experiencing the same thing? Happy using WordPress 2.7! Cheers! awsome…!! !, i`ve use this version…nice…!!! Hi When are going to upgrade this theme for wordpress 3.5.1?